The prime minister has claimed that apprenticeships quality has risen since the introduction of the levy, despite Ofsted finding the reverse. 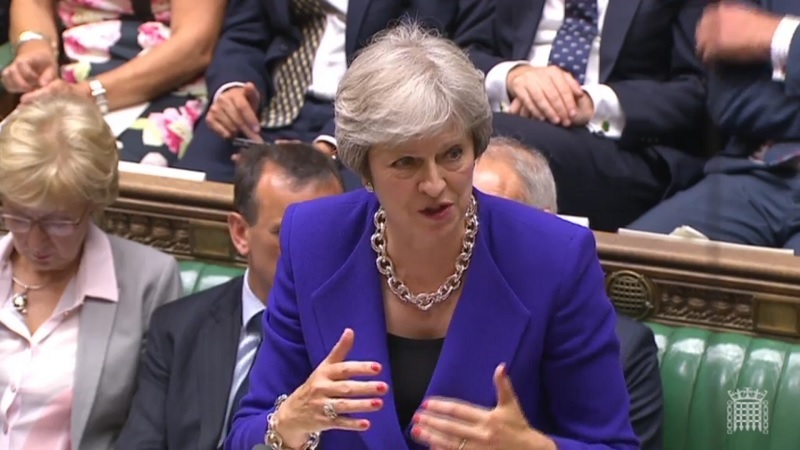 Theresa May (pictured) was quizzed on the “disastrous” government policy by Alan Whitehead, the MP for Southampton Test, during prime minister’s questions today. Mr Whitehead said that the largest apprenticeship provider in his constituency has “suffered a 70 per cent drop in apprenticeships on his books” since the introduction of the levy. “What is the prime minister doing to get this disastrous levy-based apprenticeship rollout back on the road?” he asked. What is the prime minister doing to get this disastrous levy-based apprenticeship rollout back on the road? Ms May gave an eyebrow-raising response. “What we have seen since the apprenticeship levy was introduced is actually a change in the numbers of people doing apprenticeships but also an increase in the quality of the apprenticeships that are being undertaken,” she claimed. Her comments come despite Ofsted’s deputy director for FE and skills revealing in May that apprenticeship quality is in decline. Paul Joyce went as far as to say the programmes are starting to resemble the doomed Train to Gain initiative from the mid 2000s. In May, the education watchdog found that around half of inspections carried out so far this year have resulted in “requires improvement” or “inadequate” ratings for apprenticeships. “We are concerned and want to avoid a Train to Gain-type programme being badged as an apprenticeship,” Mr Joyce told delegates at the Skills and Education Group’s conference. Ofsted is “particularly concerned” that it is starting to find “some issues where very little off-the-job training is taking place”, particularly with apprentices who are enrolled on programmes for the “older age demographic”. Just this week, a training provider in Liverpool that was training hundreds of glass industry apprentices folded after the inspectorate gave it a damning “inadequate” rating. Ofsted found that Vocational College Limited had a “significant number” of learners being subjected to lengthy enforced breaks from learning. The damaging report forced the Department for Education to cancel its funding. Train to Gain was launched in 2006 to encourage employers to deliver vocational training to adult workers. However, the business minister at the time, John Hayes, said the flagship training service was a “deadweight cost” that had no future because it gave money to highly profitable employers to train their staff when they were already willing to pick up the bill. It was scrapped in 2010. The money goes into a pot, and they have two years to claim it back to spend on apprenticeship training. But starts have instead fallen since its launch. They were down 39 per cent in April, compared with the same period in 2016, as revealed by latest provisional government statistics. Ofsted has been approached for comment on Ms May’s quality claims. The OFSTED inspections and the outcomes of them are a mockery. Learn Direct Get a grade 4 but are then allowed to operate under a different banner. The provider in Liverpool mentioned in the article has done exactly the same. Operating from the same building but instead of being known as The Vocational College now operates as GI Qualifications Ltd, set up just 2 weeks after it was closed by OFSTED. The same staff have been employed, but employers such as ourselves have been robbed of our 10% contribution to the levy and had no service. The system is corrupt and needs an overhaul.